I spent a couple of days vacillating over how to make a mac 'n cheese that is delicious, somewhat sophisticated, decadent without being too heavy, and relatively healthy. I find the gym is a good place to brainstorm recipe ideas, especially focusing on healthier and more nutritious options. A younger, hip lady suggested replacing the pasta with cauliflower. That was genius. I tend to be very stingy with my imported Italian gluten-free pasta and save it for dishes that are all about the pasta. Let's face it - macaroni and cheese is about the oozy cheese sauce (aka bechamel/mornay sauce) and the gratin topping. What's on the inside acts as a carrier. Microwave the head of cauliflower on high for 7 minutes in a large microwave-safe bowl, covered with plastic wrap. Allow to cool. In a large skillet, heat the olive oil over low/medium heat and add in aromatics: leeks, onion, shallot, garlic. Saute with some salt until transparent. Turn off heat. Meanwhile, heat the measured butter and potato starch, stirring with a whisk. Add in a dash of salt, white pepper, nutmeg, cayenne pepper. Stir for about 2-3 minutes. Slowly add in the heated milk with vigorous whisking. Bring to a slight simmer. Add in about half of the cheese very slowly with thorough stirring. Taste and adjust seasonings. Drain any water from the cauliflower and chop into small pieces. Stir in the sauteed aromatics and chopped cauliflower. In a small processor, mix together 1 cup instant mashed potato flakes + 1/2 cup of the cheese. Melt 1 tablespoon butter and add and mix again in processor with a little salt. 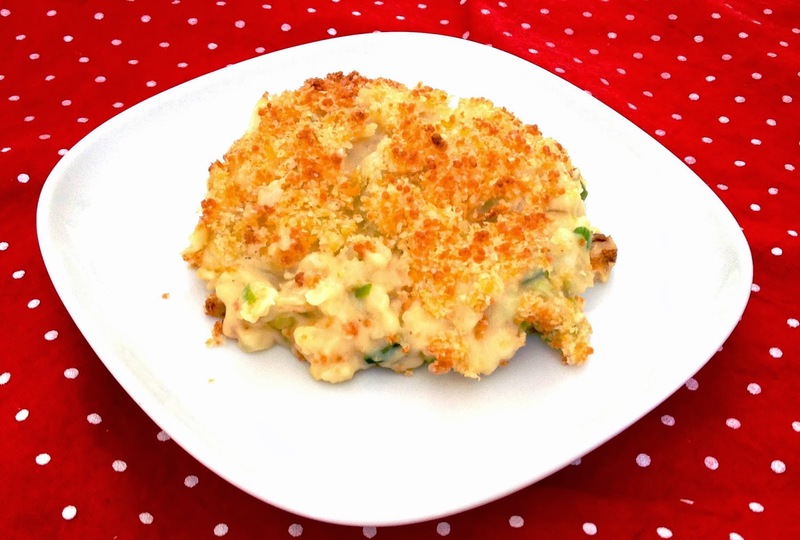 Turn the cauliflower and cheese sauce into a 8x8 pan or medium size casserole dish. Level out. Evenly distribute the gratin topping on top. Bake fore about 30 minutes, until golden brown. Remove from oven and allow to set up slightly before cutting and serving. Makes about 6-8 servings.